Does the following sound familiar? The basis of your reporting for controlling, accounting department or management is nearly always an Excel file or a bottom-up planning tool. The big disadvantage is that a spreadsheet calculation requires a lot of work and usually only the creator can make changes to it. In addition, spreadsheets do not offer the possibility of integrating data in real time or dynamic data. As a result, such data records often remain static and meaningless. Planning tools such as SAP BPC are highly complex, resource-intensive and slow. Here too, there is no possibility to visualize scenarios and simulate them ad hoc. You're rightly wondering why in times of big data, ERP and BI systems there's no easy solution that gives you a vivid, real-time simulation of what-if scenarios for your company data. This is what we call Value Driver Tree Tool. The VDT tool is a component for the SAP Lumira Designer and can be used locally on the SAP Business Objects Server. The VDT tool has recently been added to the portfolio of the American-Indian BI specialist Visual BI from Texas, with whom we have entered into a close sales partnership and for which we are the central contact in German-speaking Europe. 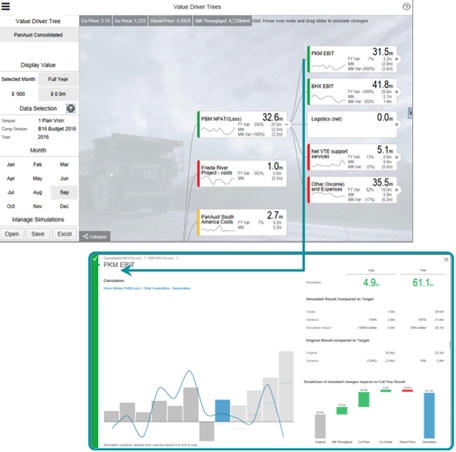 The VDT tool's major advantage is that simulations of value-driving factors can be graphically displayed in real time and what-if questions can be answered in no time at all. If controllers previously had to maintain these simulations manually in their Excel files, the VDT tool can be used to collaborate and evaluate them across departments. According to a study by Horvath & Partner, more than half of all companies are still dissatisfied with their reporting capabilities. The VDT tool provides a remedy for this problem: once you have fed your value driver tree with all relevant data, the recurring manual data collection and evaluation is no longer needed. Business modelling: Simulate the perspective of a manager on the company with dynamic modelling and identify opportunities for efficiency and improvement. Budgeting & Planning: Compare budget versions and understand deviations in the drafts. Strategic Objectives: Simulate fully-calculated scenarios based on current forecasts, budgets or actual data. Analysis: Understand the impact of changes in one or more value drivers on operating or financial results. With the VDT tool, any number of simulated changes to value drivers can be calculated and displayed within a tree at the same time. VDT is a component for SAP Lumira Designer that can be used generically and as often as required. Since Design Studio 1.2, SAP has provided partners with the ability to develop Design Studio Partner components using a standardized software development kit and integrate them into SAP data service applications. These partner components are imported into the BI server by the local IT system and are available to all BI developers from this point in time. To ensure smooth navigation and simulation calculations within the tree, the VDT tool loads all actual and plan data only once when the tree is opened from the system. Afterwards, all actual and plan data, deviations and the traffic light status of each key figure are calculated once within the VDT Math's Computing Engine in the browser. All further manual/loaded simulations within the tree are performed without noticeable delay. Would you like to learn more about the simulation of value-driving factors in real time? In our whitepaper we describe the advantages of the VDT tool in detail. We would be happy to show you the VDT-Tool in a live demo so that you can get an even better picture.